Summary: Do you get components from RadioShack? That may not be an option much longer. According to BusinessWeek (http://www.businessweek.com/articles/2014-09-11/radioshacks-last-hope-for-survival-shrinking-fast-in-bankruptcy#r=hp-ls) RadioShack is in dire straits. Some feel it could run out of money within a month. The company has 4000 stores and really wants to downsize, but their lenders won't let them shutter the 1200 locations the company wants to close. Same-store sales are plummeting an astonishing 20% per quarter. It's hard to see how any company can survive those figures. With shares at $0.97 as I write this bankruptcy is not unimaginable. KFC, Burger King and the like are to be found all over the world. RadioShack's brand is not so ubiquitous. It's unknown across large swaths of this planet, even in some fairly high-tech places. Its origins stem from 1921 when it was a shop for the new field of ham radio. Components then were hard to buy; Digi-Key and Mouser were off in the distant future. I can remember taking the tram across Boston to buy a bag of CK722 transistors from them. It's hard to imagine today parents letting a ten-year-old off on such a solo adventure, and harder still to remember what those parts cost. My nickel-per-week allowance at the time would not have allowed for much of a price. Apparently (http://en.wikipedia.org/wiki/CK722) the CK722 was manufactured specifically for RadioShack, at least in the early days, and other sites (http://www.ck722museum.com/) claim they were culls from high-quality CK718 hearing aid transistors. Sometimes the entire reject CK718 was encapsulated inside another package, labeled as "CK722," and sent to The Shack, destined for youngsters anxious to penetrate the mysteries of electronics. This site (http://www.radioshackcatalogs.com) has catalogs from RadioShack going back to 1939. One from 1963 shows lots of "hi fi" equipment, CB radios, telescopes, slide rules, and even outboard motors. A nice Hammarlund short wave radio is $429, a whopping $3300 in today's deflated bucks. There's a 3" oscilloscope for $44.50, meters galore, and, of course, lots of tube testers. Then there are the selenium rectifiers, which would sometimes catch fire as they aged and emit a foul-smell. The 1939 catalog also lists Hammarlund receivers, one of which was $243, or $4k today, right at the end of the depression. War was looming (WWII started with the invasion of Poland in September of that year) so it's hard to imagine much of a market for such an expensive bit of hobby gear. ARRL's Radio Amateur's Handbook is advertised for just a buck. $2 would get you a non-rechargeable 45 volt "B" battery for vacuum tube plates. 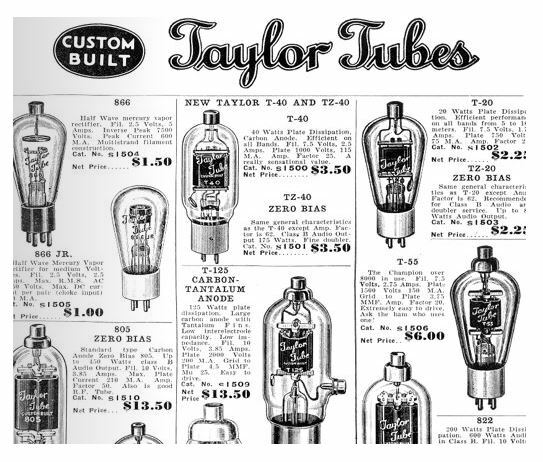 Capacitors are called "condensers," as any shade-tree mechanic would remember from the old point-based ignition systems on cars. Solder, at $0.57/pound, sure was cheap compared the price today. Later the company became one of the biggest sellers of computers. The 1977 TRS-80 was one of the first non-kit PCs. It was called the "trash 80" but was actually a fairly decent machine for the time. It was perhaps the first that was sold as a mass-market item to non-techies. Do you remember their Model 100 computer? 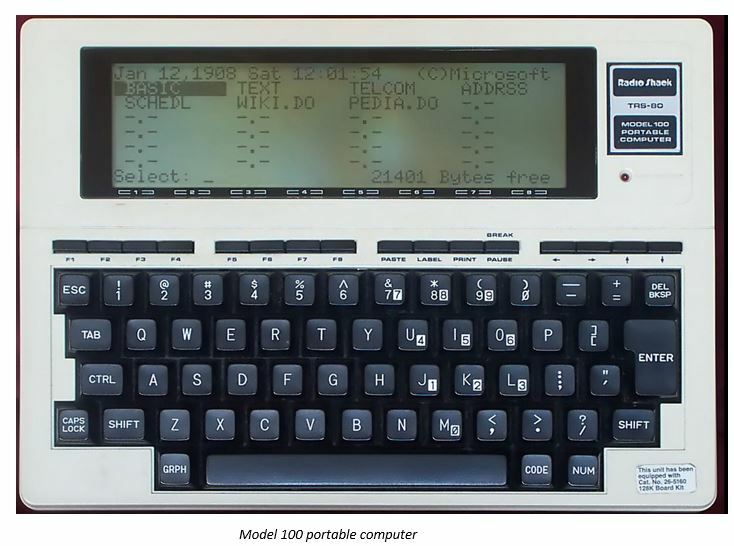 With a 1983 introduction it was possibly the first real laptop. The machine's 80C85 was practically obsolete when the Model 100 made its debut, but four AAs would run the machine for some 20 hours and the portability was fantastic. There wasn't much memory, the screen was awful, and there was no mass storage. I bought one and loved it for writing and email. (Yes, we had email back then, through Compuserve, via a 300 baud dial-up service). 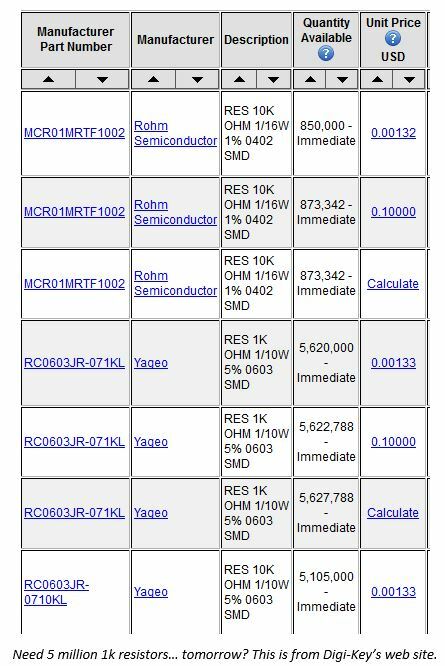 Need 5 million 1k resistors. tomorrow? This is from Digi-Key's web site. I wish RadioShack the best, and can hope the maker movement breathes some life back into their stores and component selections.